Will to win � this is what Ilona Korstin and InstaForex have in common! Being a strong-willed and dedicated athlete, Ilona constantly improves her playing technique and leads her team to victories. InstaForex Company acts the same way and actively developing and perfecting its services as well as creating favourable work conditions for its clients. Be the best and always move forward to the goal - is a motto for both the athlete and the broker that makes them leaders in their fields. Three-time European champion, the World Cup winner, three-time European League champion, three-time Russian champion, four-time Russian Cup winner, two-time France champion, three-time World League champion, bronze medalist of the 2004 and 2008 Olympics, merited master of sports � this is just some Ilona's victories. However, not only is Ilona sport-spirited, but she also has attractive appearance, which allowed her to become the face of Russian basketball according to FIBA. Ilona is a very interesting and friendly person, which is why journalists from sports magazines and other mass media love to have interviews with her. Besides, Ilona obtained brilliant education both in Russia and France. She speaks several languages, and her interests are not only focused on basketball, so communication with her is so interesting and able to break stereotypes about sportsmen. A leader by nature, Ilona is a shooting guard and the captain of Russian women's basketball team. 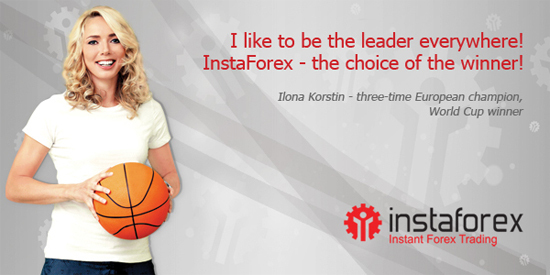 In an exclusive interview to InstaForex broker Ilona answered the question concerning the role of the captain in a basketball team: "All the five players cannot score at the same time at a relevant moment. One must have a combative spirit in order to become the leader and bring your team to the victory". Probably, it is the combative spirit that helps Ilona succeed in sports. Obviously, determined character and will to win are essential for achieving success both in sports and on Forex. Ilona is charming and gracious, but strong and determined to conquer new sports Olympus heights, as well as InstaForex international broker that is ready to reach new heights of Forex trading.